1,112 UK gamers chimed in on the Xbox One reveal to give us their two pence. Every time a new console is announced, it summons a peculiar blend of anxiety and simmering rage from the gaming public. A recent poll by Voucher Codes Pro asked UK gamers what they thought of Microsoft's big reveal of the Xbox One, so we can precisely quantify that cocktail of emotions. The results are mixed, with a distinct undertone of disappointment from the responses. According to the UK, the full living room experience isn't what customers are looking for - they just want to play games. Of those who responded negatively, the common thread seemed to be a dislike for the multimedia approach. 47% stated that a "game console should stick to gaming," reinforced by 39% who said they "didn't care about its television capabilities." The press conference that revealed the Xbox One received some direct criticism, with 42% of participants wishing that they knew more about the console's line-up of launch titles. Other complaints ranged from disinterest in Skype to the somewhat petty argument that the console's aesthetics weren't "exciting" enough. Each person surveyed was asked to select one or more words from a list that best described their feelings about the Xbox One. The top answer was "Excited" (59%), followed by "Underwhelmed" (52%), "Enthusiastic" (44%), "Indifferent" (39%), and "Disappointed" (27%). Those who answered positively had little else to say: 37% said they were just excited for a new game console, and 19% admitted that they would have been excited regardless of what features the new Xbox actually had. The most common cause of excitement was the Xbox's cloud capabilities, with 31% eager to free up space on their hard drives. The survey ended with the big question: "Which console release are you looking forward to the most; the Xbox One or the PlayStation 4?" The numbers seem to indicate that Sony is in the lead at the moment, with 61% of the opinion. Voucher Codes Pro's George Charles commented on the results of the survey, questioning whether Microsoft's marketing is at odds with its primary consumer base. "Microsoft's President of Interactive Entertainment told the conference that it's not just a games console but the 'ultimate all-in-one home entertainment system.' That's all very well and good, but is that really what consumers want? According to our poll, it would suggest not." None of this means that the PlayStation 4 will necessarily sell better on actual store shelves, or that nobody out there is pumped about Skyping their friends through their game system. It does, however, call Microsoft's high-level design decisions into question. 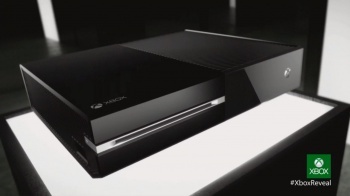 Is the Xbox One overproviding for a market that only wants to play games?